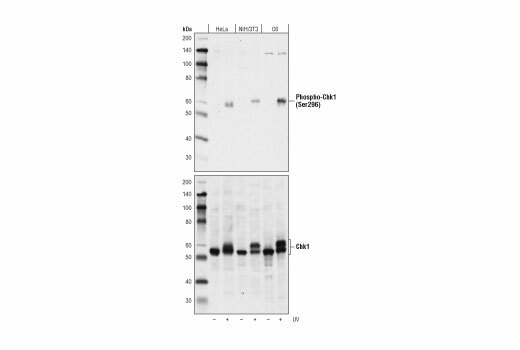 Western blot analysis of extracts from HeLa, NIH/3T3, and C6 cells, untreated (-) or UV-treated (100 mJ/cm2, 2 hr recovery; +), using Phospho-Chk1 (Ser296) (D3O9F) Rabbit mAb (upper) or Chk1 (2G1D5) Mouse mAb #2360 (lower). Phospho-Chk1 (Ser296) (D3O9F) Rabbit mAb recognizes endogenous levels of Chk1 protein only when phosphorylated at Ser296. Monoclonal antibody is produced by immunizing animals with a synthetic peptide corresponding to residues surrounding Ser296 of human Chk1 protein.